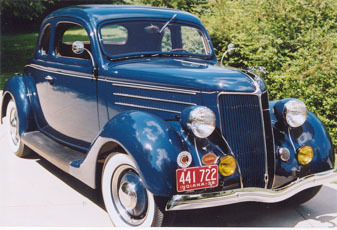 Car Information: V8 flathead Motor with Manual-3 Speed Transmission Washington blue with Tan Interior and black Top 1936 FORD 5 WINDOW COUPE SHOW QUALITY RESTORATION, FRESH. RUNS AND DRIVES LIKE A NEW ONE. FLATHEAD V8, RUMBLESEAT, FOG LIGHTS.